Born to lead, not just compete, home-grown haircare brand, Vierro, has finally launched in the UAE as the answer to the escalating demand for high-quality haircare products, one that doesn’t call for loosening purse strings. Vierro is the result of the most brilliant minds in haircare coming together for the same goal – delivering beautiful hair, perfected by science. 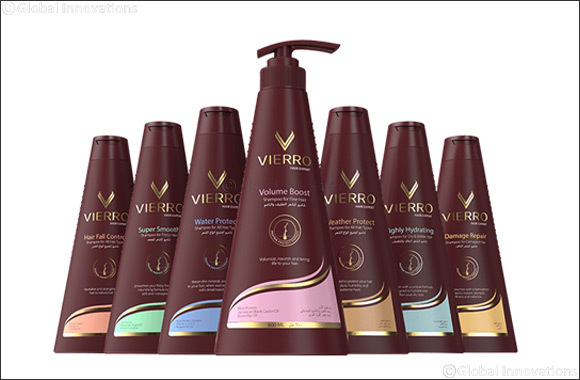 The haircare segment in the region is experiencing significant growth, and Vierro is all set to take center stage with its range of innovative haircare products that will cater to all hair types. Vierro addresses one major problem that men and women face in this region -- one that has been overlooked by most haircare brands -- the negative effects of hot weather and desalinated water on hair. Its weather and water protect formulas will not only restore but protect hair against these harmful elements. The science behind Vierro is revolutionary, and is considered a major development for haircare, raising the bar for every haircare brand in the region. With Vierro, science guarantees beauty. Unlike any other brand, Vierro’s Water Protect and Weather Protect ranges are specially designed taking into consideration the climatic conditions of the Middle East. A careful mix of oils and proteins protect your hair from dust, humidity and extreme heat. They also help retain the minerals and proteins in your hair that are usually lost when washing frequently with desalinated water. Until now, the modern woman has always had to rely on multiple remedies for healthy and beautiful hair. With Vierro’s revolutionary “Protein Protect Therapy” formula, they can enjoy healthier, shinier hair. It’s the first-of-its-kind to deliver equally on both ends of the haircare need state – control and enhancement. The hair experts behind Vierro have specifically formulated a range of proteins as a therapy for distressed hair. Hydrolysed Quinoa Protein, Hydrolysed Rice Protein, Hydrolysed Silk Protein, and Hydrolysed Wheat Protein are some of the ingredients used in its products. These proteins play a vital role in keeping your hair healthy, smooth, shiny and strong. They also help in conditioning the scalp, prevent drying, boosting volume, reducing hair breakage, improving elasticity, and repairing damaged hair. Other well-known ingredients used in Vierro’s superior hair solutions include Arginine, Cocoa Butter, Coconut Oil, Flaxseed Oil, Jamaican Black Castor Oil, Jojoba Oil, Moroccan Argan Oil, and Cocoa Butter. Shampoo & Conditioner duos - Weather Protect, Water Protect, Volume Boost, Highly Hydrating, Damage Repair, Super Smooth, Hair Fall Control.